Supreme Court Rule In Favour Of Makarfi. The Supreme Court has declared former Kaduna State governor, Ahmed Makarfi as the authentic chairman of the Peoples Democratic Party, PDP. 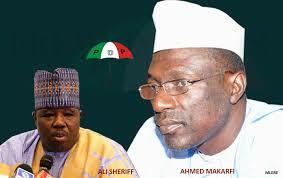 The Court sacked the Ali Modu Sheriff-led faction of the party. Recalled that a five-member panel of justices presided by the Chief Justice of Nigeria (CJN), Justice Walter Onnoghen, held May 22 reserved judgment on the dispute. A statement from the Head of the Publicity Division of the party’s Wadata House, Mrs Chinwe Nnorom on Tuesday confirmed Wednesday July 12 as the date notified the parties by apex court. “Our teeming members and supporters who are willing to attend are hereby encouraged to do in solidarity with the PDP,” she said in the statement. Buhari Sympathised With Party On Ex-Vice President’s Resignation From APC. Kogi APC Congress: Fear Grips Faleke, Tells Group To Boycott The Process.